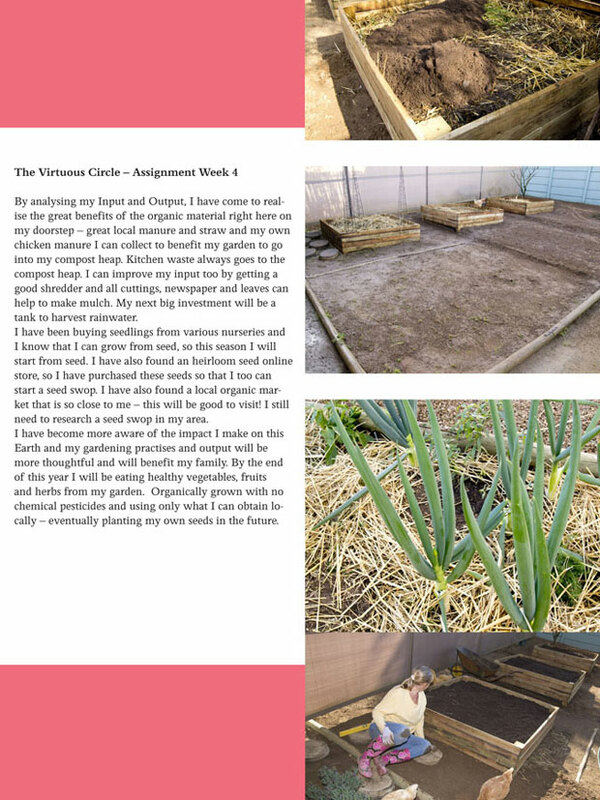 For the past 4 weeks I have been taking part in The Organic Garden course by My Garden School. What a wonderful course it was and how the lecturer, Stephanie Donaldson made everything clear and concise and that organic gardening does not need a masters degree but a clear and practical mind to know how to work with mother Earth. I really enjoyed logging in every Saturday morning and downloading that weeks lecture. Stephanie’s lesson is a comfortable 20 minutes and the assignments are fun to do. They are current and practical and relevant to your own garden. You just want to jump into the garden and get things done! I have become more aware of the impact I make on this Earth and my gardening practises and output will be more thoughtful and will benefit my family. By the end of this year I will be eating healthy vegetables, fruits and herbs from my garden. Organically grown with no chemical pesticides and using only what I can obtain locally – eventually planting my own seeds in the future. 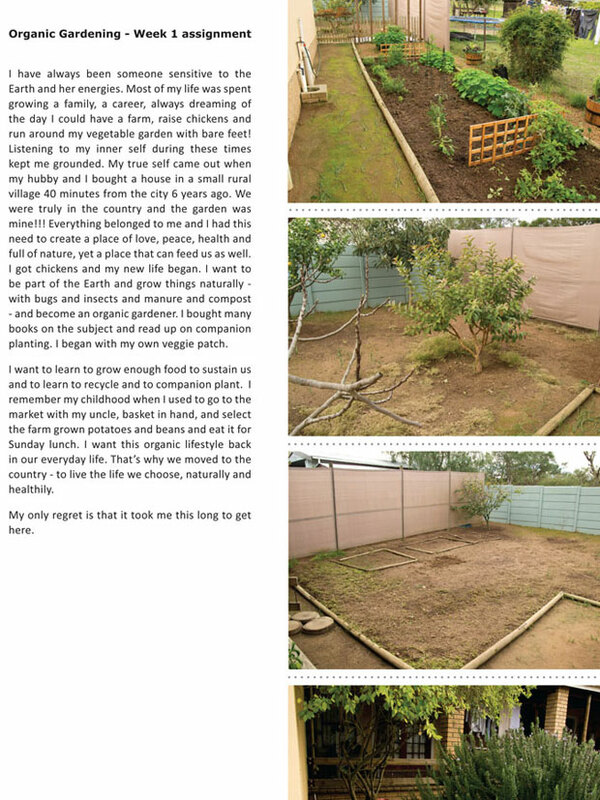 I have learnt about the benefits of all the organic material in my back yard. 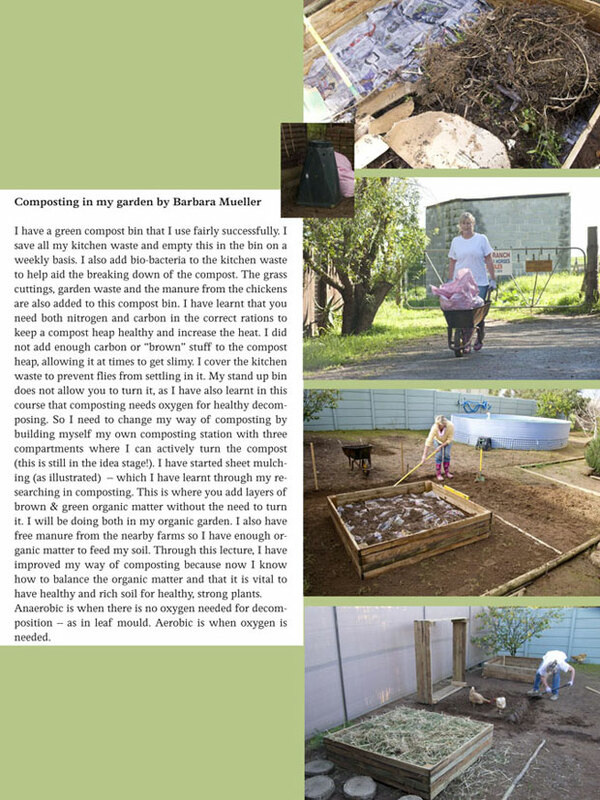 How to make compost and how important the soil is. Here are the 4 weeks that have kept me busy. If you are interested in doing any of the online courses, MyGardenSchool is your unique online horticultural classroom. They bring you gardening courses taught by the world’s most acclaimed authors. You can now learn about gardening directly from the experts, from the comfort of your own home, wherever you are in the world. You have one-to-one personal contact with your tutor, through your virtual classroom. Join if you are interested in doing a four week online gardening course. Book now for August 6th! Have fun and happy organic gardening! Barbie, gogogogo and take care! Many will benefit from your post. 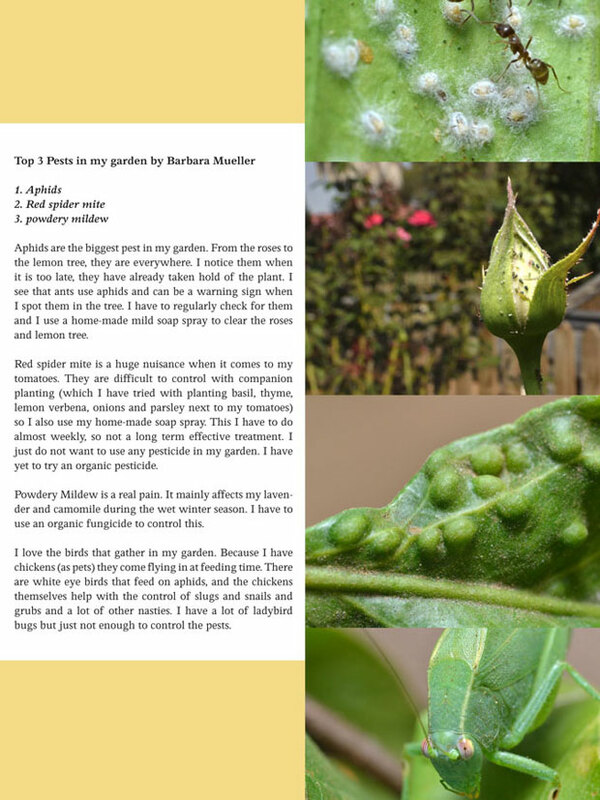 The spider mites – Noelle in Arizona – says spray underneath the leaves with water. Just water. It’s like the thrips on roses – it’s dry out there, and they come to our nicely watered gardens ;~) Going good, I have lots to learn from you. Thanks for showing us your homework – so wonderful that you persevered and your dream came true. Those are lucky chickens. Well worth it and easy to do! The best part is that you practise what you learn!! Wow Barbie! I’m really impressed with how much you took from this course and are actually incorporating in practise. I didn’t realise how much of what you were doing was inspired by what you were learning. A very nice post – very informative. I’m glad you enjoyed the course. Hi my friend!! The course came just at the right time. I was slap bang in the middle of wanting to know how…. and then the answers came!! Timing was perfect! I had fun doing it and learnt alot!! I will definitely do another course – maybe one a year!! I am very impressed. You had a dream and are now realizing it. I think a lot of people have that same dream, or a similar one. Great going on improving your composting skills, which is so beneficial. I have been trying to grow our own food, or buying from the local farmer’s market. I have learned to can, and feel great now about feeding my body and my family. I applaud your efforts, and your successes! Thank you so much Holley – it gives me a great sense of accomplishment doing this course and the knowing that I’m on the right path. Thank you thank you! It is wonderful you got a lot out of your courses. Gardening is not so much about steadfast rules as it is about experience and enthusiasm. There are many ways to do just about everything in a garden. As a trained designer, it would seem odd for me to say this, but I find after doing it for almost twenty years, the rules go out the window pretty often. Sometimes things are unexpected and don’t always respond to certain tried and true methods. Landscaping is another matter. What an architectural print says goes, and not always is that the best solution when you are out in the field during installation, especially if it is a commercial new build. The unexpected does occur. Even soil may not be as tested. Then there is a problem. Closer to home, I have the same pests to deal with as you and am not lucky enough to have resident chickens at home. It was always a dream of mine to have a couple of hens patrolling the yard and making fertilizer for me. Your chickens really are pets. I never realized they could be pet-like. The ones at the farm are not very nice. Hi Donna – Thank you so much for sharing this valuable insight. I believe more and more that as gardeners, we have to listen more to our plants and soil. And with landscaping, I have had to change ideas so often because of them not being practical. As you say – the unexpected does occur. I’m glad I’m only doing my garden.